They are also benefitting some of our ultimate favorite non profits. -Orange you glad that the Fantastic George Orange is going to be performing his comedy and clown routine for the benefit of 826CHI? -Why, yes. Yes, I am. 826Chi is thrilled to be partnering with the sure-to-live-up-to-its name, Brilliant Corners, vaudeville-wondershow-extravanganza tthis weekend Sept. 16th - Sept. 18th at Eckhart Park (Chicago and Noble). On the third day of the fun, Sunday September 18th, at 5:30pm, we'll be co-presenting The Fantastic George Orange under a true old world circus tent! Tickets are only $15 and part of the proceeds will go directly to us! Grab yer tickets here! Take a trip with us down the rabbit hole of his show - an experience not to be missed. George Orange has dedicated himself to bringing a new breed of unconventional and thought provoking comedy to the broad audiences of street theater festivals and circus big tops. 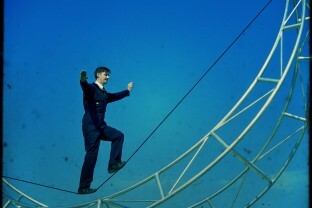 As an eccentric European clown and slack-rope dancer from Cardiff, George is often compared to Mr. Bean and Jacque Tati. He captivates audiences, crossing the boundaries of language and age, with his charming, mostly non-verbal, very visual, show. Opening music provided by Albanie and Her Fellas! Come check out newcomer, Brilliant Corners of Popular Amusements runing September 16 through the 18th at Eckhart Park. They're ambitiously combining live music and circus arts with carnival rides, games, to create a Vaudeville for the 21st Century! Brilliant Corners’ Magic City Tent is running 3 days of acrobats, aerial artists, and more, along with live music and short films. On Saturday, September 17th, proceeds from one of these performances — Bindlestiff Family Cirkus , a group that combines elements of Vaudeville, Circus, Wild West Shows, Burlesque, and Sideshow — generously benefits CHIRP Radio. Tickets for the Saturday performance are available here. The previously-announced act, Ricochet, had to cancel for personal reasons. Music fans also will find plenty to like over the course of the weekend, with live performances by Shellac, Bill Callahan, School of Seven Bells, Dan Deacon, and many others under the bigtop in the Criss/Cross Tent. Brilliant Corners promises to be more than a festival — its website teases pop-up events, one night shows, and a general state of mind — but the weekend should be a doozy of an introduction. Check out the Brilliant Corners website for specifics.